The stylish AptBcn Super Balmes apartments are located in the centre of Barcelona, just off Plaza Catalunya. Featuring a colourful and chic design, the spacious accommodation offers free Wi-Fi. Rooms in the AptBcn Super Balmes have a balcony and large glass doors, allowing for plenty of natural light. They are equipped with a fan and electric heater. Towels and bed linen are included. The living room comes with a double sofa bed and the kitchen includes a washing machine. Bathrooms include shower facilities. 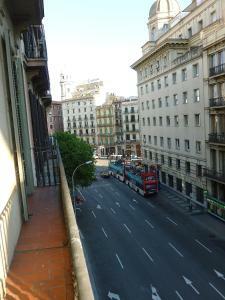 Universitat Metro Station is just 100 metres from the apartments. A bus to Barcelona Airport leaves from outside El Cortes Ingles department store on Plaza Catalunya, 200 metres away. Please note that a refundable € 500 damage deposit must be paid on arrival. Please note that there is a mandatory cleaning fee of € 120. There is no reception service for these apartments. Please let Aptbcn Super Balmes know your expected arrival time in advance. You can use the Special Requests box when booking or contact the property. Apartment for 10 people with 10 single beds, divided into 5 twin rooms. Rate: € 375.00 ... € 518.18; select dates below to get current rates. Apartment for 12 people with 12 single beds, divided into 3 twin rooms and 2 triple rooms. Rate: € 530.00 ... € 544.62; select dates below to get current rates. This spacious, air-conditioned apartment features 2 twin bedrooms and 2 triple rooms, all with a private balcony. The lounge has a single sofa bed and a double sofa bed. It also features an HD flat-screen TV, and the dining room has an extendable table. The kitchen includes a microwave, coffee maker and washing machine. There are also 2 bathrooms. Bed linen and towels are provided. Rate: € 375.00 ... € 528.00; select dates below to get current rates. This stylish, air-conditioned apartment features 4 bathrooms, 3 twin bedrooms, 1 triple bedroom and a fully equipped, american-style kitchen with a microwave, hob and kitchenware. Each room has a balcony and a TV. Rate: € 430.00 ... € 529.57; select dates below to get current rates.